February 5, 2017 February 28, 2017 by Sally Ride Science . Posted in " Tam on STEAM: " . Tags " math, STEAM, STEM " . As she went through school pursuing math degrees, she increasingly came to appreciate another side to the discipline—a side that let her use her intuition. Williams has excelled in both aspects while building a career as a math professor at the University of California San Diego. She is a leader in the field of analyzing stochastic networks. (Stochastic, she explains, “is just a fancy word for ‘random.’ ”) Her work has a variety of applications, including streamlining traffic on networks such as the Internet or crowded freeways. Williams grew up in Bendigo, a city about 100 miles northwest of Melbourne. Bendigo sprang up as a boomtown in the 1850s when gold was discovered there. Ornate Victorian buildings recall the city’s gold-rush-era past. Her mother was a nurse and her father was head of the business studies department at a local college. Williams loved spending time outdoors, often playing tennis or bicycling. Books about famous scientists inspired her. “I liked reading about new discoveries and the people who made them,” she said. She admired the work of Marie Curie. And she took a particular interest in the writings of the British philosopher and mathematician Bertrand Russell. She had a number of teachers who encouraged her. Her mother and father were also an invaluable source of support. “My parents really encouraged me to do well in school and also to get a very strong education in math and science,” she said. When she was ready to go to high school, she had a choice of an all-girls school or a coed school. Her parents steered her to the coed school because it had more extensive math and science offerings. When Williams was in high school, computers were just becoming available in educational institutions. She joined the local computer club, which advertised “your computer for 20 cents.” A membership gave a student access to a mainframe computer at a local college for 20 cents a year. In her spare time, she wrote programs, submitted as “batch jobs” on punch cards. It took a day to get the results from one run. While she was in high school, she wrote 100 programs in a variety of computer languages. The experience introduced her to the notion of using computation as an aid in solving problems. After a three-year bachelor’s degree program, Williams qualified for a fourth honors year. As part of her honors thesis, she found a new, shorter proof of an existing mathematical theorem. She stayed at the University of Melbourne to get her master’s degree. Her research was on differential games—the study of mathematical models of tactical situations that evolve over time. The field originated with applications to military strategy. It has since expanded to include applications in engineering and economics. For her PhD, Williams headed to Stanford University in California. In some ways, moving halfway around the world didn’t feel like a big change. California and Australia have similar landscapes and climates, and many cultural similarities, Williams noted. She did have a little trouble getting used to the way the locals talked. “For the first three weeks, people couldn’t understand me and I couldn’t understand them at the grocery store,” Williams said with a laugh. Her Australian accent has stayed with her through her decades in California. At Stanford she studied probability and worked on the fundamental theory of a stochastic (random) process called reflected Brownian motion. This process models the random movement of particles confined to a region. It has applications to physics and operations management. After earning her PhD, Williams joined the faculty at UC San Diego in 1983. She was attracted by the university’s strong math, science, and engineering programs. “You can develop a single mathematical theory that covers several different types of congestion—in transportation, high-tech manufacturing, customer service, telecommunications, computer systems, and even biological networks,” she said. She has worked with colleagues in electrical engineering, mechanical engineering, and other fields to tackle a variety of problems related to heavy traffic in systems such as wireless communications networks and the switches that route information on the Internet. She is always on the lookout for new problems to solve. In recent years she has broadened her focus from analyzing congestion in human-made systems to include the development and analysis of models of biological processes such as those occurring in gene regulation. In 2009-10 she took a one-year sabbatical from the Math Department, partially supported by a grant from the National Science Foundation, so she could work closely with biologists in UC San Diego’s BioCircuits Institute. See USING MATH TO UNDERSTAND NETWORKS IN LIVING THINGS for more on Ruth Williams’ research. Williams has received many honors for her work. In 2012, she was elected as a member of the National Academy of Sciences. 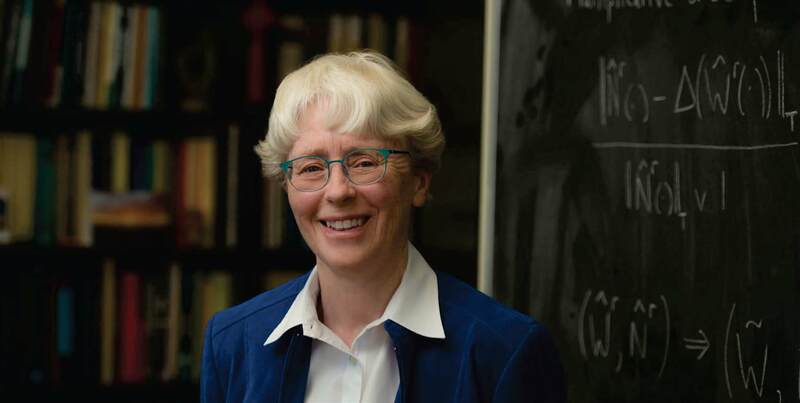 She is a fellow of the American Academy of Arts and Sciences, American Association for the Advancement of Science, American Mathematical Society, Institute of Mathematical Statistics (IMS), and the Institute for Operations Research and the Management Sciences (INFORMS). She has served as president of the IMS, a major international society for researchers in probability and mathematical statistics. As a math professor and a leader in professional groups, she has taken a role in encouraging the next generation of mathematicians. Some studies have suggested that girls are more likely than boys to struggle in math classes because they lack confidence in their abilities. Asked about this research, Williams noted that both male and female math students sometimes lack confidence. “I wish we could put stickers on these devices that say ‘mathematics inside,’ ” she said with a smile. Much of Ruth Williams’ research at UC San Diego has focused on mathematical analysis of models used to understand and control congestion in networks at times of heavy traffic. Her work has applications in fields such as transportation, communications, and manufacturing. But in recent years, her curiosity has turned in a new direction. In addition to analyzing human-made networks, she is exploring how to use mathematical models to understand biological pathways. Examples include the enzymatic processes involved in gene regulation, metabolism, and other functions in living cells. Williams attended a conference workshop on probability in biology in the mid-2000s. That’s when she became intrigued with the idea of using probability to model biological networks. She joined a working group on the subject. She began to read scientific papers about probability in biology. One study that caught her eye was from a research group headed by Jeff Hasty and Lev Tsimring. “I thought this was interesting—and then I realized the group was at UCSD,” she said. Hasty is a Professor of Bioengineering and Biology, and Tsimring is a Research Scientist. They, along with Professor Katja Lindenberg, are the leaders of the UC San Diego BioCircuits Institute. So in 2009-10, Williams took a one-year sabbatical from the Mathematics Department to spend time in the BioCircuits Institute. Her work was partially supported by a grant from the National Science Foundation. She collaborated with Hasty, Tsimring, and their post-doctoral scholars and graduate students. She worked on developing models to understand how enzymes operate in living cells. Her experimental colleagues work mostly with single-celled organisms such as yeasts and bacteria. In cells, she added, the enzymes are always limited in number. At times of high demand, this can create a bottleneck in a biological pathway. The result may be a traffic jam a bit like the ones in human-made transportation systems or computer networks. The field of applying mathematical modeling and analysis, along with computation and experiments, to biological networks is growing, Williams noted. It even has a name now—quantitative biology.